We in the West may think we know the meaning of hospitality, but once you compare it to the Japanese tradition of omotenashi, you’ll feel the true definition must have been lost in translation. Forget the Western way, where the giver may be acting hospitable with the aim of gaining something in return. At the heart of omotenashi, instead, is a hospitality focused solely on the recipient. It’s a host attending to the needs of a guest before they can even be vocalized. With the concept ingrained so deeply in Japanese culture, there are many ways to experience it in full, elevated fashion on your trip. Here are five promising places to start. You don’t have to wait till touchdown to get your first taste of omotenashi — it’s alive and well at 30,000 feet on your All Nippon Airways flight. 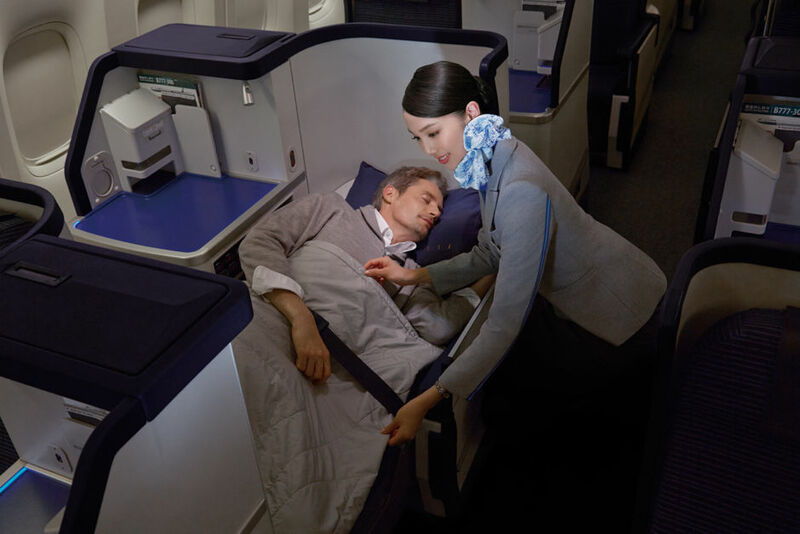 You’ll find it in everything from the attitude of the staff (rated #1 in all of Asia by Skytrax) to the amenities available on board — adjustable, 180-degree flatbeds; 17” monitors; pajamas and cardigans; and noise-cancelling headphones are just some of the treats awaiting those in business class or above. When it’s time to sleep, you’ll wrap yourself in a down comforter (presumably to remind you that you’re traveling among the clouds). And we haven’t even gotten to the menu yet. ANA’s “Connoisseurs” program brings you cuisine options created in partnership with elite chefs from Japan and around the world. When hunger hits, you’ll be choosing between dishes like Japanese beef slow-boiled in a rich demi-glace sauce and channel rockfish marinated in a sweet, tangy miso sauce. Actually, you don’t have to wait till hunger hits, because ANA now lets you pre-order your meal as early as 24 hours prior to departure. Consider it another fun step in planning your ultimate Japanese adventure; and consider All Nippon Airways the consummate host, ready to set you on your path with a proper dose of omotenashi. 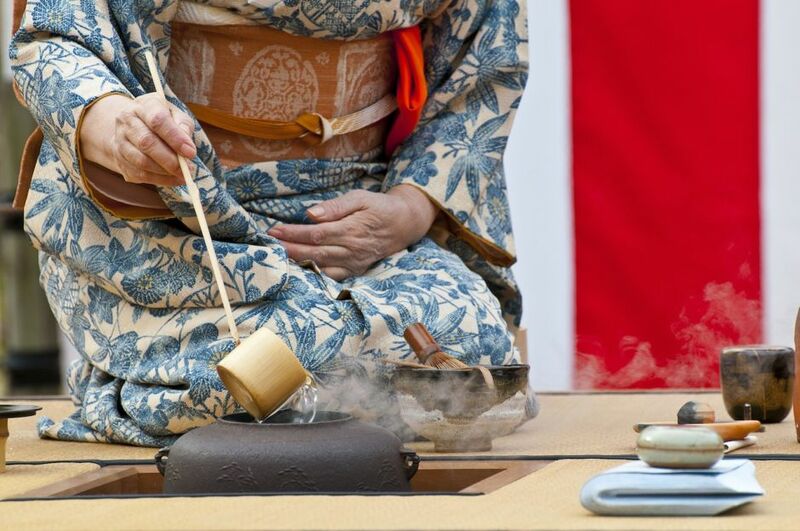 Once you land in Japan, there’s no more fitting continuation of the omotenashi experience than a sado, a Japanese tea ceremony. In fact, the practice of omotenashi has its roots in the sado, a tradition which itself dates back to the 9th century. A host partakes in the time-honored tradition of preparing and serving tea to their guests, a gesture intended to come directly and genuinely from the heart. Wabi-sabi, the Japanese idea of beauty in evanescence, is a key part of this tradition as well. As such, all utensils and dishes are kept simple, directing the participant’s attention to the tea. A proper ceremony can only be performed in a tatami room, with mats laid on the floor to dictate where the host and guests should sit. Most often the host will wear a kimono, with guests dressed either in one as well or in a formal Western-style outfit. Tips: A sado can last up to four hours, depending on the degree of formality. Wear modest, plain clothing, and avoid overdoing it on the jewelry or perfume. When served the tea, pick it up with your right hand and place the bowl into your left palm. Turn the cup so its front is facing away from you, drink a few sips, and then place it back on the mat. Repeat this process until you’ve finished your tea. On your ANA flight, you may notice the flight attendants bowing slightly when they interact with you. When you arrive in Japan, you’ll see this practice repeated by every local you meet. Another manifestation of omotenashi, bowing demonstrates respect, acts as a gesture of greeting, and conveys thanks, among other things. A small bow of the head is more casual, while a deep bow from the waist is a strong and sincere sign of esteem. As a foreigner, it’s expected that you’ll return a small bow, an offering that will be deeply appreciated. Consider again the example of the sado: When you first enter the tatami room, you should bow your head slightly to your host as a thank you for their welcoming you. Bow to them again when leaving after the ceremony. By doing so, you honor them and the time they took to host you. More generally during your trip to Japan, you’ll notice people bowing to you when providing your receipt, food, or checking you into your hotel. In each of these instances, it’s appropriate to bow back as a sign of acknowledgement and respect. Think of bowing as a silent “thank you,” and you’ll have a good sense of when and how the gesture should be used. If you want a truly immersive experience of omotenashi — one that will change your definition of “hospitality” for good — arrange a stay in a ryokan. These small country inns are designed to provide the utmost personalized care and service to their guests. 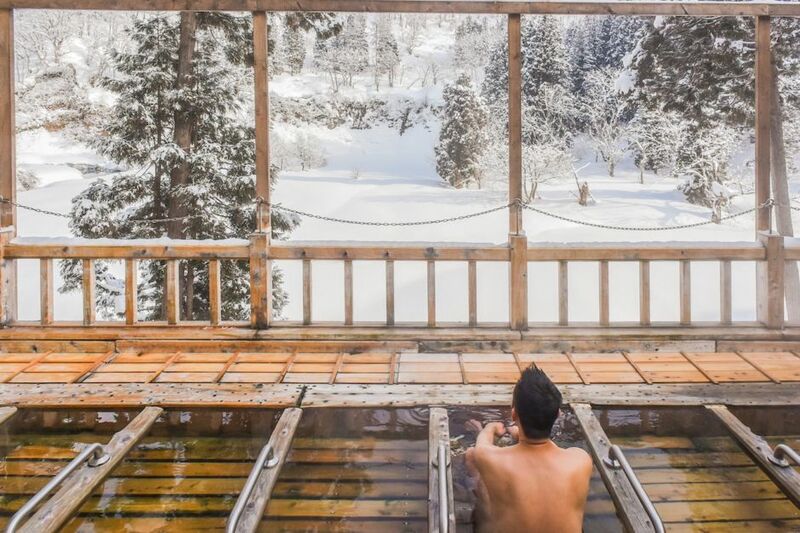 Explore your inevitably beautiful surroundings — one of the best parts about ryokan is they tend to be located near onsen, or hot springs — and then come back to enjoy a traditional multi-course dinner with a menu that reflects the region. Typically designed for a one- or two-night stay (sort of like a spa), treat the ryokan experience as a relaxing, quieter excursion during your otherwise potentially busy trip. As is the case in many cultures, flower arrangements are used to denote care and respect. 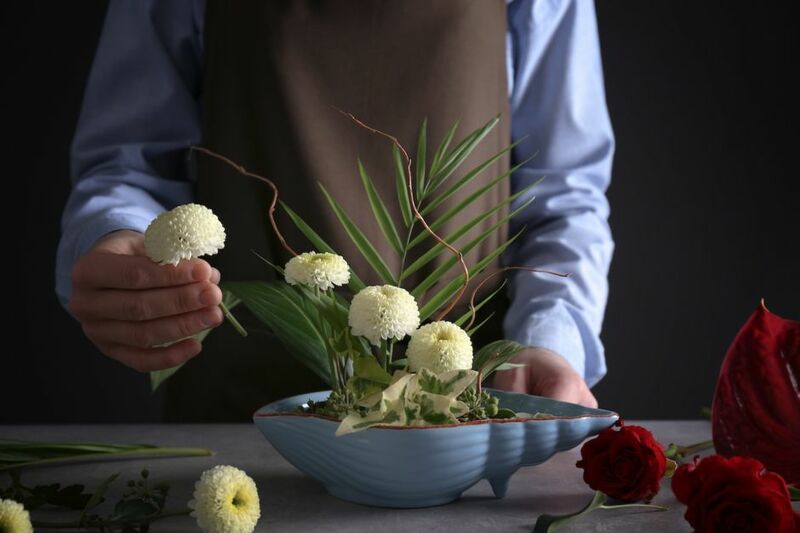 The Japanese — no surprises here — bring this concept to an even more beautiful level as they express omotenashi through the art of ikebana. In Japan, ikebana is the meticulous arrangement of flowers, branches, and leaves into a spectacular form. Beyond the outward beauty it projects, ikebana also allows participants to create a spiritual connection with nature, refreshing the body and soul. Consider taking time to learn the practice of ikebana during your visit, and then present your creation to a loved one. And with that, you’ll be well on your way to grasping the spirit of omotenashi. This post is proudly produced in partnership with the All Nippon Airways.